@avarx_ is part of the Swiss team for the European Cyber Security Challenges and also a member of the TYPO3 security team. I joined with him to start a set of TYPO3 rule exclusions for the OWASP ModSecurity Core Rule Set 3.0 (short CRS3). This is a set of rules to be deployed on a WAF in order to protect web applications. See an article on Linux Weekly News to get an intro to what this is all about. 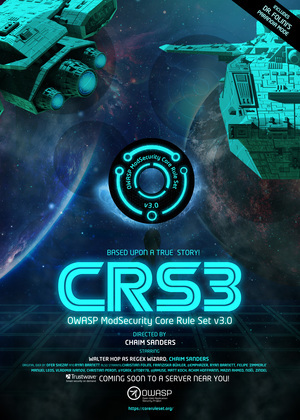 The poster of the CRS3 release. The problem with CRS3 and complex software are false positives. That is benign traffic that looks like a potential attack to ModSecurity. The WAF will thus block the request. CRS3 solved most of the false positive problem, but there are a few ones remaining. What you need is thus something like a policy file that tells ModSecurity that it faces a TYPO3 install and this rule should be disabled in this situation. The rule exclusions build on the architecture we implemented for WordPress and Drupal for CRS3. The new policy is defined in REQUEST-903.9003-TYPO3-EXCLUSION-RULES.conf. It is activated by setting the variable tx.crs_exclusions_typo3 in crs-setup.conf.